Reigning Mafia boss of bosses Salvatore Maranzano was shot and stabbed to death in his Park Avenue, Manhattan, office. The assassins, sent by underworld bosses who had been targeted by Maranzano, posed as government agents to gain entry to the offices. 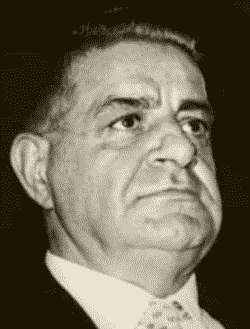 Decades later, Joseph Valachi became one of several "inside" sources who provided background information on the killing. Following the Mafia's 1930-1931 Castellammarese War and the April 1931 assassination of then-boss of bosses Giuseppe Masseria by his own lieutenants, Valachi served on a crew that was a sort of palace guard for the new boss of bosses Maranzano. In late summer of 1931, Maranzano expected a raid from government agents. Fearing arrests on gun charges, he instructed his guards not to bring weapons to his office, the Eagle Building Corporation on the ninth floor of the New York Central Building, 230 Park Avenue. Valachi was upset by the order. He told his associate Buster, "I don't like this. They are trying to get us used to come up here without any guns. I ain't going to come around here any more... You better talk to that old man and make him understand..." . About twelve days later, on September 9, Valachi was called to Maranzano's home, 2706 Avenue J in Brooklyn. At that time, the boss of bosses revealed that he was planning a new war to eliminate those he viewed as his rivals. .
"Joe, I can't get along with those two guys," Maranzano said. Valachi understood that his boss was referring to "Charlie Lucky" Luciano and Vito Genovese, who recently assumed control of the large crime family previously run by Masseria. Maranzano revealed that there were others he felt needed to be eliminated, including Al Capone, Frank Costello, Guarino "Willie Moore" Moretti, Giuseppe "Joe Adonis" Doto, Vincent Mangano, Ciro Terranova, Arthur "Dutch Schultz" Flegenheimer. Valachi was told to meet Maranzano at his office the following afternoon at two o'clock. Before leaving the Maranzano home, Valachi cautioned Maranzano not to appear in public and he let the boss know his feelings about the rule against bringing guns to the office: "I never liked that order about us coming down the office without any guns. Gee, after all, anything happened to you, we will all be out in the street." Maranzano assured Valachi that all soon would be settled. The next day, September 10, Valachi prepared to meet with Maranzano as planned, but men higher in the organization called him away and kept him occupied until early the next morning. Valachi returned to his apartment at 108th Street and Second Avenue. Only then did he glance at the daily newspaper and learn that "they killed the old man." The paper also reported that Vincenzo "Jimmy Marino" Lepore, a Maranzano ally in the Bronx, had been murdered at a barber shop, 2400 Arthur Avenue. At a subsequent meeting with fellow Mafiosi, Valachi was given a story of the assassination. 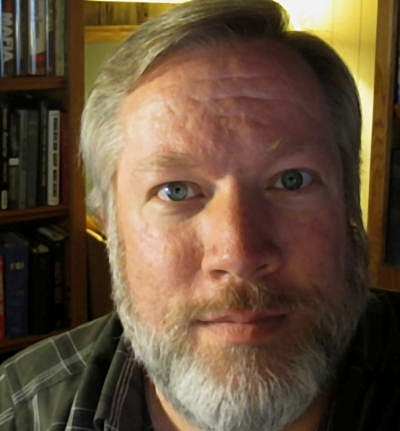 Girolamo "Bobby Doyle" Santuccio, who was taken into custody as a witness to the killing, told him, "...It was the Jews that came up at the office and they showed phony badges and they said that they were cops... There was about fifteen guys in the office at the time that they came up." Valachi, Joseph, The Real Thing - Second Government, unpublished, 1964, p. 360. Valachi, Joseph, The Real Thing - Second Government: The Expose and Inside Doings of Cosa Nostra, The American Mafia, mafiahistory.us. 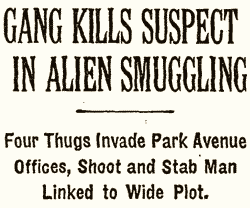 "Gang kills suspect in alien smuggling," New York Times, Sept. 11, 1931, p. 1. "Racket killing diary found; lists a judge," Brooklyn Daily Eagle, Sept. 11, 1931, p. 1. Goheen, Joseph, "Gangs kill 4, 1 in offices on Park Ave.," New York Daily News, Sept. 11, 1931, p. 2.